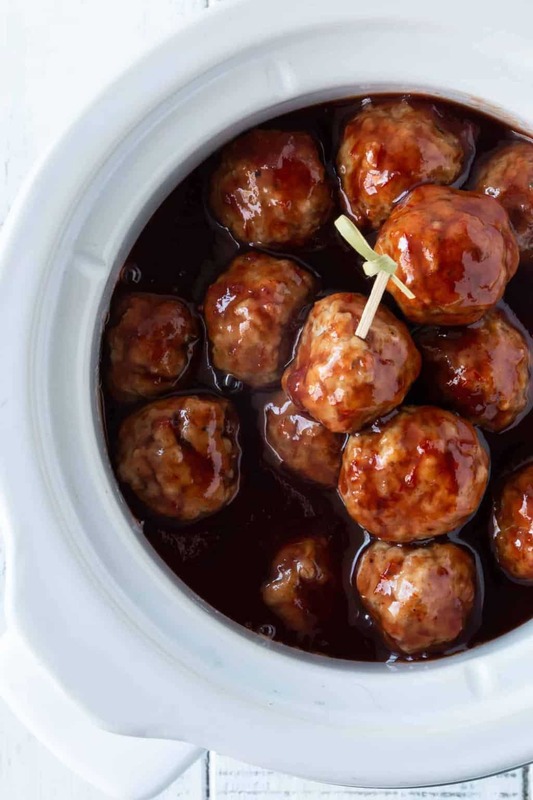 Keep all of your guests happy with a buffet of these 3 Easy Slow Cooker Cocktail Meatball Recipes! Appetizers don’t need to be fussy to be crowd-pleasing. Take these 3 Easy Slow Cooker Cocktail Meatball Recipes, for example. You’re sure to find one (or maybe three) favorites for your next appetizer spread. If you’re lucky to have a special meatball recipe that has been in your family for decades, by all means use it. I’m a frozen meatball gal through and through, so that’s what you’ll see me recommending in these cocktail meatball recipes. Tip: Keep a bag or two of frozen meatballs in your freezer, and you’re halfway to easy crowd-pleasing munchies for everyone. The other half of the cocktail meatball equation is the sauce. 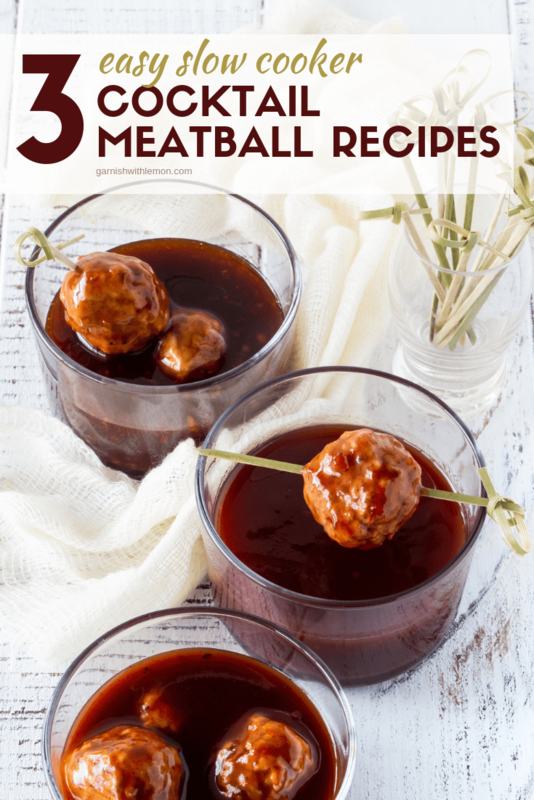 These three cocktail meatball sauce recipes contain anywhere from 2 to 6 ingredients each, many of which you probably already have in your pantry (brown sugar, BBQ sauce, jelly…you get the idea). Yes, these recipes may be short on ingredients but each one packs a mouthful of flavor. You’ve likely enjoyed this 3-ingredient meatball at grandma’s house or your neighbor’s football party. This traditional recipe for equal parts grape jelly and chili sauce to give this Classic Cocktail Meatball a flavor that is familiar and crowd-pleasing. You just can’t go wrong with a Classic Cocktail Meatball. These sweet and spicy meatballs are the best of both worlds. Snappy barbecue sauce, sweet cherry jam and smoky chipotle peppers in adobo sauce give these meatballs equal parts sugar and spice. Add extra chipotle peppers if you want to dial up the spice or decrease the amount if you want a more kid-friendly snack. As the name suggests, you’ll find generous amounts of warm grated ginger and zesty fresh garlic in this Honey Garlic Ginger Meatball sauce. But these unmistakeable flavors stay smooth and balanced with just the right amount of sweetness from honey and a bit of brown sugar. Perfect party food! What are you waiting for? 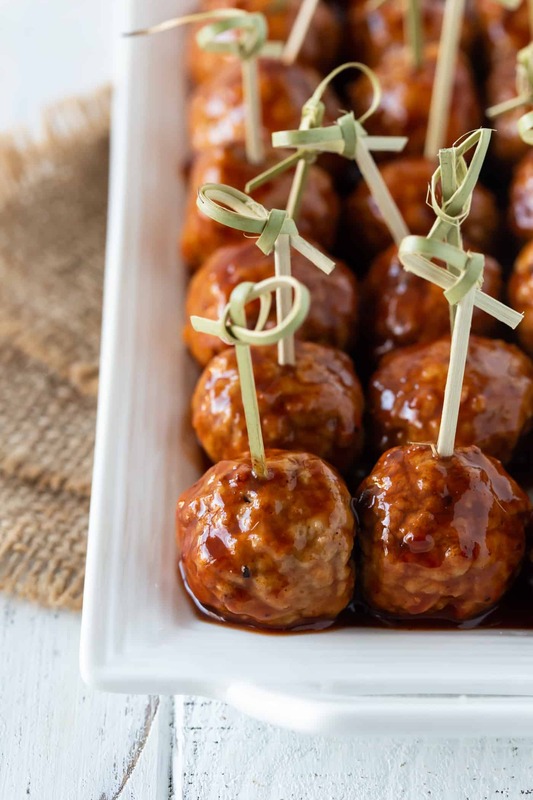 Crowd-pleasing party food doesn’t get much easier than these Slow Cooker Cocktail Meatball Recipes. Fire up the Crock Pot, friends! This 3-ingredient cocktail meatball is a classic for a reason - it never goes out of style! Place meatballs in a slow cooker. Whisk sauces together and pour over meatballs. Cook on low for 4 hours. Click HERE for the Cherry Chipotle Barbecue Meatball Recipe. 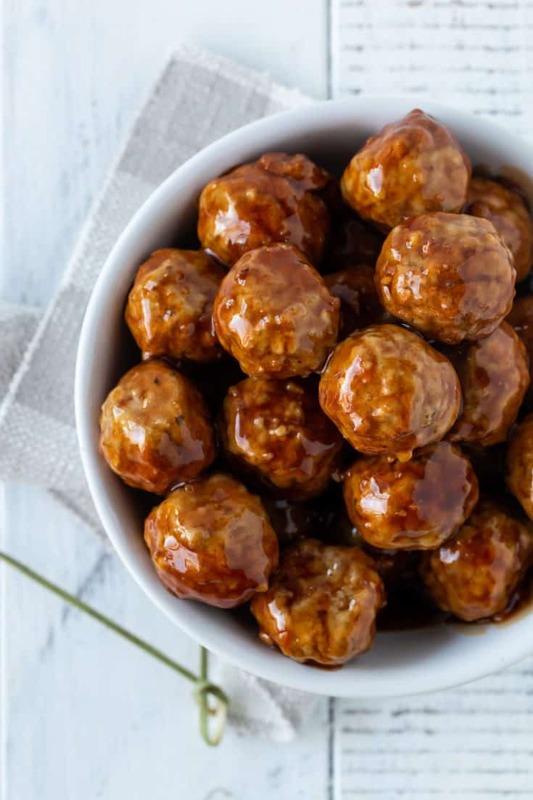 The familiar flavors of honey, garlic and ginger make these cocktail meatballs the perfect party food! Place meatballs in slow cooker. Whisk together remaining ingredients and pour over meatballs. Cook on low for 4 hours.